Before I could try out my home brew OBDII interface, the check engine light came on for my 1997 Honda Accord. It has 180,000 miles on it. It is my extra car that I only drive a couple times a week. I read code PO135, the book says the sensor heater error. Makes no sense. Went online and found this. Looks like I need a new oxygen sensor. I reset the code to see if it comes back. No sense in moving too fast, if it is really broken it will set the code again! Might be a fluke. Nope. A day later the check engine light is back. Off to find an oxygen sensor! 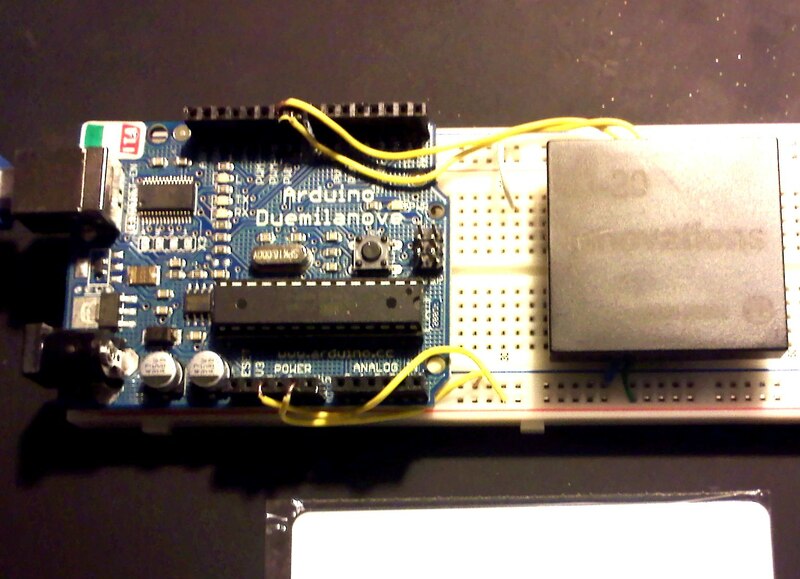 Research on the Arduino OBD II interface for reading codes, auto MPG, etc. This post is just a place to keep some notes and links while I develop this project. Why do this? Monitor live engine, MPG, etc. Diagnose check engine lights, log data on the car. I'm also thinking the car modders would love to have lights that respond to what the vehicle is doing, flames that brighten when the engine revs etc. 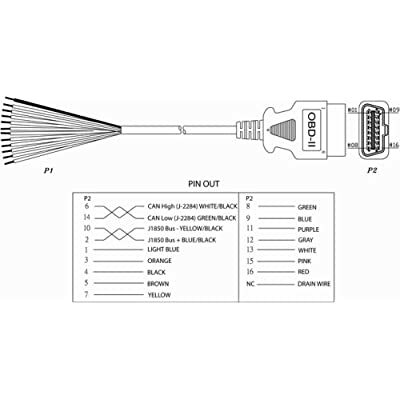 There are some adapter cables to RS232, but why add money buying different connectors. I suppose I could have scrounged a 9 pin from an old motherboard. Too much work. Here is the pinout. This cable has an open wire end i can just solder in. Manufacturer discretion. GM: J2411 GMLAN/SWC/Single-Wire CAN. J1850 VPW--The connector should have metallic contacts in pins 2, 4, 5, and 16, but not 10. ISO 9141-2--The connector should have metallic contacts in pins 4, 5, 7, 15, and 16. J1850 PWM--The connector should have metallic contacts in pins 2, 4, 5, 10, and 16. The project involves interfacing the car's computer, which runs at 12V. Arduino runs at 5V. After that, it is all software. The OBD II has a line called ISO K line, which is a bidirectional serial bus. It seems there are a couple routes people have gone. Using an ELM 323 or 327 OBD to RS232 adapter IC. These are $14 on scantool.net, in clearance. Otherwise they are $30 and seem to be hard to buy right now. Connecting direct to OBD protocol, using a level shifter. 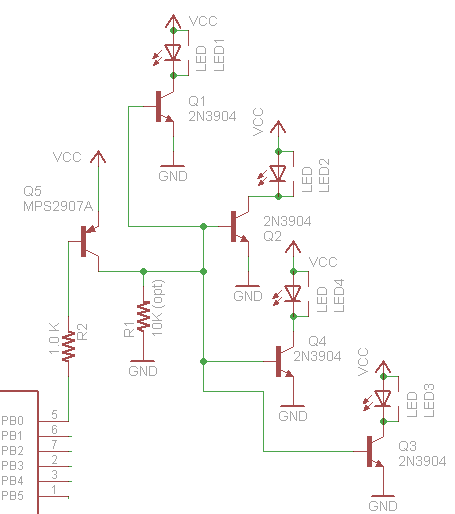 Using a MC33290 or MCZ33290EF level translator IC. Found these are hard to get, end of life'd. There may be replacements, but this is not worth the effort. Just use some transistors to build one! I have some 2N3904 that cost 33 cents lying around. This guy did it this way. I think this circuit is missing a resistor for the 12 to 5V division, and the first stage should be to 5V to keep the Arduino safe. But it shows the concept. Easy. Cheap. You can see where this is going. Don't be scared of a couple of transistors! OK, the ratios of his resistors THEORETICALLY keep the Arduino from seeing 12V, but being a consumer device circuit designer this circuit is not safe. If the K line ever touches 12V, or if one side or the other of this circuit is not powered, RXD will float to 12V and cook the Arduino. NOTE/UPDATE - RX comes from the collector not the grounded emitter on Q4. Schematic is wrong but I no longer have the orginal to edit. This is the way it should be. Somebody pointed this out years ago but for some reason I couldn't see the obvious. Wikipedia is always my friend. OBDII is a bit more complicated. Different cars use different protocols. Dang. I have Hondas, a 1997 and a 2007. So I'm guessing i can still use the K-line. ISO 9141-2. This protocol has an asynchronous serial data rate of 10.4 kBaud. It is somewhat similar to RS-232, but that the signal levels are different, and that communications happens on a single, bidirectional line without extra handshake signals. ISO 9141-2 is primarily used in Chrysler, European, and Asian vehicles. The CAN bus speed may be as fast as 1 MHz, although the OBD-II ISO 15765 specification specifies two speeds which may be used for on-board diagnostics, 250 KHz and 500 KHz. So it looks like I should support K wire and CAN both. Cool - a high paydirt google hit give me this. All the electrical stuff is here! Most of the CAN IC's have a uController built in, and cost $20+. Yuck. I could handwire a circuit. This part is probably worth the $5. The CAN bus was going to max out the Arduino and make it hard for it to do anything else. I would have spent $5 on the devices to interface. Uh oh! Looks like I need another part to actually interface to the bus. Boo! This guy has already done it, wants to sell for 30GBP. Yikes. I'm thinking a $10 shield will make a nice project. Not so bad, the CAN interface chip is only $1.12! And there is a cheaper version of the controller: MCP2515-I/P-ND for $1.98! This might be a <$10 board yet! OK, ordered the MCP2515 and MCP2551 and got them almost immediatly from Digikey. I put together a quick lash up. Then I finally got around to taking the OBDII cable out to the car and checking if I have a CAN bus. I have a 2007 Accord, and some older cars. I was sure the 2007 would have a CAN bus, since they are required in 2008. But you can guess. Nope, open circuit between 6 and 14. Doh! Major setback and I"m going to go back and build the K line version first now. So I have my interface circuit together, using 4 transistors, some resistors, diode and a cap. Made a version for less than $5, not including the prototype board. I will write it up once I'm sure it's really working. Need to get some basic code going to begin talking. Looks like the obduino32K has some good code. These guys have gone way over the top on the code. 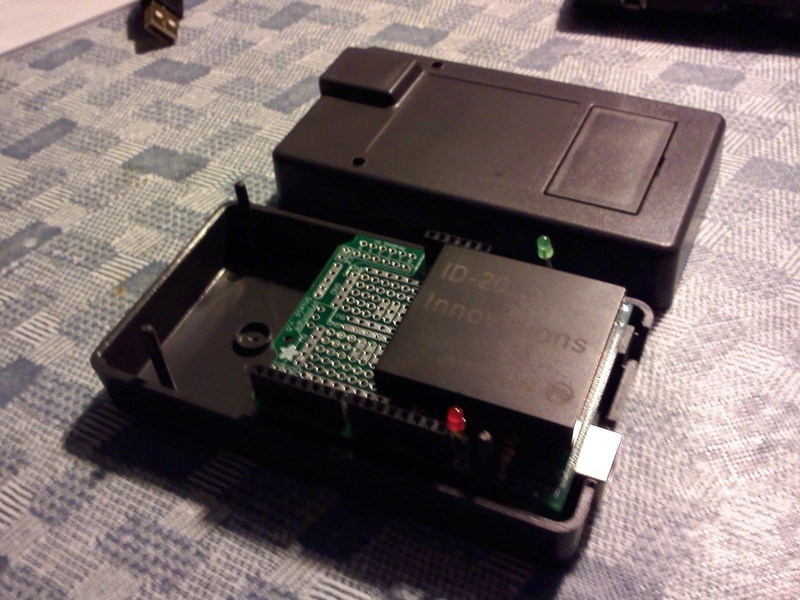 Decided to put my OBDII K line interface circuit together with an LCD and load the obduino32K code. The code compiled without much trouble, and the LCD comes on, and the K line gets wiggled. Today I will plug it into my car and see what happens. See the circuit diagram above. Basically I am building the circuit from http://code.google.com/p/opengauge/wiki/OBDuinoDiagram but I am not using the MC33290, since I couldn't find one. I put together a level translator with a handful of cheap transistors, similar to the diagrams I quoted above. Functionally equivalent to this picture: Also odd that there are no pull up resistors on the switches. OK - debug time. The board comes up, the K line wiggles. I tried this in two Honda's and a Toyota and never get past the initial sync. I need to strip down this code to a basic sync and a dump of the response to see if the car is responding and I'm missing or mangling it, or if there is no response. I looked at the data sheet of the MC33290 and I'm pretty sure my circuit should work. I have an LED on the K line (not directly) so I can see there is activity. Still stuck. I can't get the car to respond to the Init. May be i'm using the wrong protocol, my interface circuit may have problems, or my code is no good. I'm going to begin to deconstruct things and start with some basic bit banging the control lines to see what is up. A note of a neat website. I will try to get some of my stuff listed. IR TV sleep timer setter. - in the field and working great! Nintendo DS game cartridge save file reader. Worked but was flaky. Need to get back to debug it and write it up. BatchPCB: Getting PCB making up and running, may just build a LCD shield to get started. OBD reader. Started with CAN bus, switched to K line due to my car. Testing stalled because my car won't respond. XYZ CNC arduino based machine. Got some parts, building it up. VGA Output for Arduino. Totally useless but it's gotta be fun! Mag Stripe reader The readers are all over ebay. However I'm not sure the point of doing this, just curious about what is encoded on all those cards in my wallet. Car Compass My car doesn't have one of those displays that tell you the direction you are driving. Could I build one? The GPS seems overkill for this function, but it works fairly well if you are moving. There must be a compass module that can be bought. On Ebay they are crazy expensive, like $100. Might as well buy a GPS module and an arduino for that price. GPS Warmer Colder Program in a location, and it tells you how far away and in what direction it is. Uses GPS. GPS I already built will do that with a few lines of code. Debug the oscillator on the CAN bus interface shield. Maybe I have the wrong caps. On hold due to lack of CAN bus automobile to test with. Test the K line interface box, and build up a more permanent version. As always, somebody has already done the thing I thought of and made a web page. However I'm sure I can think of a new twist. Maybe I will look into transmitting as DVI in one of the lower res modes, or just VGA. Now that sounds like fun! It took some staring at the cryptic documentation and the web site below to figure out the circuit, so I drew it up, since the drawings elsewhere were awful and had errors. Thanks to http://hcgilje.wordpress.com/resources/rfid_id12_tagreader/ for the head start. Rewrote the code so that it keeps a list of tags to be granted access. Upgraded to arduino-0021, and replaced the add on NewSoftSerial library with the built in SoftwareSerial libarary. The built in library is not as good as the add on, but it makes it easier for others to get my code running. 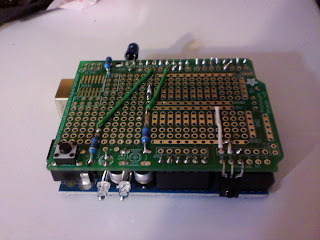 Photo of the Arduino with the proto shield stacked on top. The RFID module is soldered to a breakout board which is in turn soldered to the prototype shield. Indicator LEDs are installed sticking up high so they will poke out of the box when done. The unit placed inside the bottom half of the Sparkfun project box. This box fits an Arduino perfectly. If I had the project to do over again, I'd have put the RFID module on the other end of the prototype board so it was centered in the box. I built the unit while i was waiting for the box to come, and didn't plan this ahead properly. I was thinking I might put a small LCD readout on the end of the prototype board, that is why I did it this way. In the end the LCD wasn't really useful and I deleted it. All buttoned up with the holes for the red and green LEDs drilled. I'm going to repeat information in the previous post on the prototype version, so the writeup is all in one place. The RFID module reads out serial ASCII data, and all you have to do is connect that output to a pin on the Arduino. You use the SoftwareSerial library to be able to define any pin as a serial input. Otherwise you have to use the TX/RX pins, and that interferes with serial communication to the computer. Set the RFID reader serial speed to 9600 baud. Other speeds i found spewed garbage. The sketch looks for codes and compares them to a valid list. I can't imagine anyone could pull the compiled code off the microcontroller to see the list of valid tags. Plus the RFID reader has a good 5 inches of range, so you can put the reader INSIDE the door if you want. It even reads from the back of the RFID module. I found the reader only reads the tags from Sparkfun. It does not read HID tags (at least the ones I have), it does not read pet chips, or Metro smartcards. I was disappointed as a hacker, but the project still works great. You could add a data logger or an ethernet shield if you want to save a record of what tags were read or send that information across the internet. The ID-12 is functionally identical, with a smaller range and uses less power. Pick that one for a battery operated project, or if range isn't important. This little breakout board for the RFID module is worth the $0.95 to make the pins plug into the breadboard. I got a couple of these tags for $1.95 each. RFID Tag - 125kHz. Even if you have your own tags, i'd get one to be sure the reader is working when you build it. A red LED, a green LED, 2 1kohm resistors and a switch for reset. If you don't have the miscellaneous stuff, you can get all this with the protoboard from Adafruit if you buy the proto kit for $12.50. This was much cheaper, so i ended up getting this instead. It is really for autos but worked fine. Put together the basic Arduino RFID reader in about an hour! It was way easier than I expected and worked the first time! 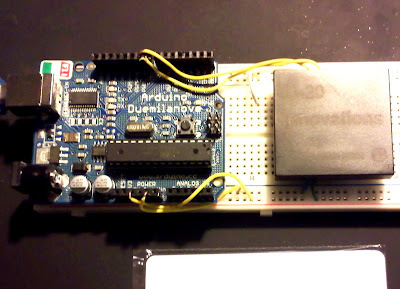 The RFID module reads out serial ASCII data, and all you have to do is connect that output to a pin on the Arduino. The serial library called in the code (the link is in the code) lets you put a serial input on any pin. You can read your tags, and put if statements in the loop to activate a pin on the arduino to make a lock, or whatever you want to happen when a card is read. The ID-12 is functionally identical, with a smaller range and uses less power. Pick that one for a battery operated project. A solderless breadboard and some wire and you are good to go! 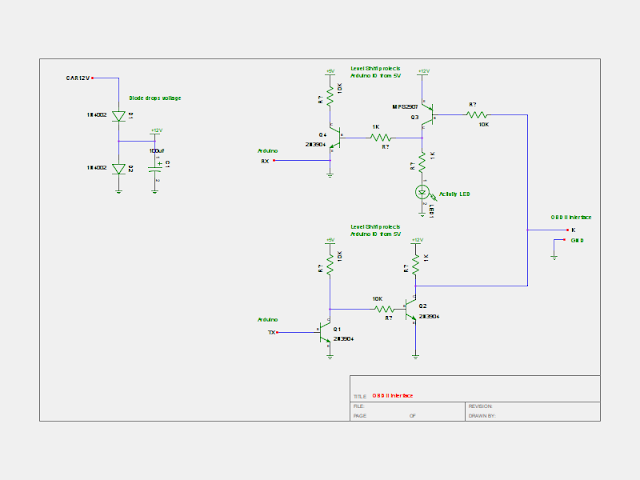 It took some staring at the cryptic documentation and the web site below to figure out the circuit, so I drew it up since the drawings elsewhere were awful and had errors. 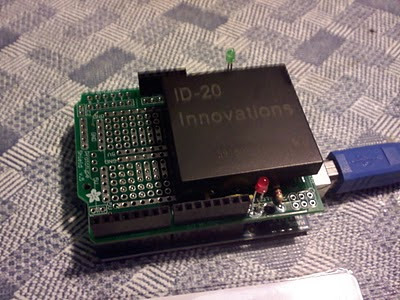 I've started putting together an RFID reader, using an ID-20 module from Sparkfun and an Arduino. This post is just a place to note a couple links to information I'll need. This is what I got so far. The RFID is pretty pricey! Sparkfun is a good website, the only place I could find the RFID reader. However, the stuff took a week and a half to come from Colorado. Hacktronics and Adafruit are 3 days (for me on the east coast). And of course, and Arduino Duemilanove, now selling for $25. I got a new Uno version to try out as well, either will work. I learned my lesson buying the Chinese knockoff boards from Ebay. Save money but no workie. It appears that i connect the output pin to the serial pin on the arduino and then just let her rip. We will see if it is that easy. Now that this project is finally up and running in field trials, I'm finally going to write it up. The purpose of this project is automatically turn on the sleep timer of the television. Story: My wife is an insomniac and stays up late every night watching TV. She eventually falls asleep and leaves the TV on. She NEVER remembers to set the sleep timer, plus the TiVo remote doesn't allow setting the TV sleep timer, and who knows where the original TV remote is most of the time. We have DirecTV, and about 3 or 4 in the morning they do a download. The TV goes black and quiet for a while, then comes back to life when the download is done. This wakes me up every night and i have to get out of bed and turn off the TV because my wife as fallen asleep and lost the remote in the bed somewhere. Arrrgh! How it works: Based on an Arduino board, it has an IR receiver ripped from an old broken TV, and an IR diode from a remote from a TV we don't have anymore. The device sits on the TV stand, directly in front of the TV. When it detects IR traffic from the remote, it keeps resetting a timer. If the timer expires, it assumes that the user has fallen asleep and is no longer controlling the TV. The device then sends a remote control to the TV to set the sleep timer. If the user doesn't notice (they are likely asleep), the sleep timer counts down and shuts off the TV. You might ask why don't I just send a power command? Problem is I can't really be sure the TV is on or off. What if she actually turned the TV off before falling asleep. It would be a disaster to have the device turn ON the TV. Using the sleep timer is the perfect fail safe. If the TV is off, the sleep command does nothing . If the TV is on, it will count down and turn off. Just takes a little longer than turning it off directly. We have a SONY Bravia TV and use a DirecTV TiVo box primarily. This works for those devices. You will have to modify for your devices. IR Receiver. I scrounged this from an old broken TV set. You can even get these at Radio Shack http://www.radioshack.com/product/index.jsp?productId=2049727 for $4. 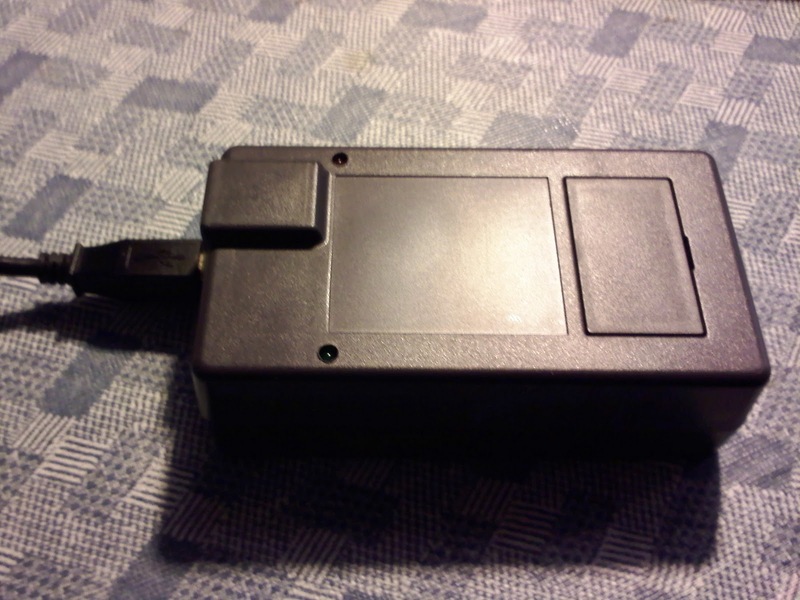 A 9V AC adapter. I used one from a broken router, needs to be 500mA and 9V. You can use up to 12V, but it can make the Arduino hot. I've used adapters down to 6V, and they have been fine too. int led_yellow = 13; //led to indicated TV user is drowsy. Same as led_green. I used the prototype shield, which is probably overkill but made a nice compact unit. I bent the receiver and yellow/green LEDs so they pointed towards the user. The IR tx diode is mounted on the back edge and points towards the TV. I put on a reset switch because it is always nice to have a wave to recover. This project proved way more difficult than i expected. The device is both a reciever and a transmitter, and needed to detect IR transmission as an interrupt because I was running a timer from last activity. Combining these three functions was tricky. There was an IR library on Arduino playground http://www.arduino.cc/cgi-bin/yabb2/YaBB.pl?num=1176098434 , that was based on delay(),. The receiver worked just fine, but the transmitter failed to control the TV. I experimented for hours and finally discovered that the timing of the bits in the Arduino were off. I had to set the times much shorter than the spec, because the Arduino was timer and interrupts were slowing things down. In the process of debugging and googling help, the http://www.arcfn.com/2009/08/multi-protocol-infrared-remote-library.html library bubbled up through google and i downloaded it. This is much more solid and uses the PWM as the timing reference for transmit, so the TV liked it. Luckily it supports the same devices that I had in my home, so I used it almost unmodified. I had further troubles with the sending routine stopping the receiving routine, which the author admits to in his blog comments. All you have to do is restart the receiver after you have transmitted. I had further troubles with ambient IR triggering the receiver, and had to add a code filter to ignore anything that doesn't match a valid IR code from either the TiVo (NEC codes) or Sony. So here is the code I ended up with. you need to download the IR library and put it in your libraries folder. This code has debugging to the serial monitor included, which helps you understand what is happening. Just making note of this link to an Arduino TV-B-Gone, since i have the hardware built already i'll probably have to try this. I've used his IR library and it works very well. Some of the other code out there relies on delays and breaks when the Arduino is busy. Adafruit posted a kit, which of course i could just build, but what fun is that?